If you’re here, it means you’re our Secret Santa and therefore I just want to say: You are the best Secret Santa of them all. In the battle royale game of Secret Santa, you are making headshot after headshot, murdering all other Secret Santas in cold blood purely for sport. In the hero shooter of Secret Santa, you are using your freeze ray to turn all other Secret Santas into frozen otter pops of death. In the zombie apocalypse game of Secret Santa, you are unleashing mutant reindeer into the infected wilderness where they use their glowing red noses of destruction to fend off hordes of lesser Secret Santas. In the real time strategy game of Secret Santa, you have followed the most optimal build order and have sent wave after wave of elf minions to overwhelm your unprepared Secret Santa adversaries. In the fighting game of Secret Santa, you have air-juggled and combo’d every other Secret Santa into a KO and in the final battle against the big boss Secret Santa, you have won via a ring out and a legit KO in a 2-1 scorcher. What I’m trying to say is... you are the greatest Secret Santa of them all. Both my young son Makoto and I will be participating in the TAY Secret Santa this year! Makoto is just four years old, but he is a very good boy and wants to send something to someone. I’m including him as part of the gift list! We have yet to play the newest Pokémon game because it comes out on Friday, but I am hoping it will be the first major game that we play together (well, second if you count some rounds of Mario Kart where my son basically lets the car control itself around the track). Stuffed Pokémon toys! Or really any Pokémon toy! My son already has an old stuffed Raichu that I had from when I was a kid and a very cute beanie baby-style Victini that I got him when he was just a baby at a Pokémon Center in Japan. I think Makoto would love a stuffed Pokémon toy and this might be something easy to order online! I hope it would be something cute... then again it’s Pokémon, that’s kind of their thing. I love Overwatch and have been collecting Overwatch stuff for a while. Makoto actually will sit on my lap and watch me play—it’s the first video game we ever bonded over! I have the Figma. I have some shirts. I have plenty of in-game stuff too. 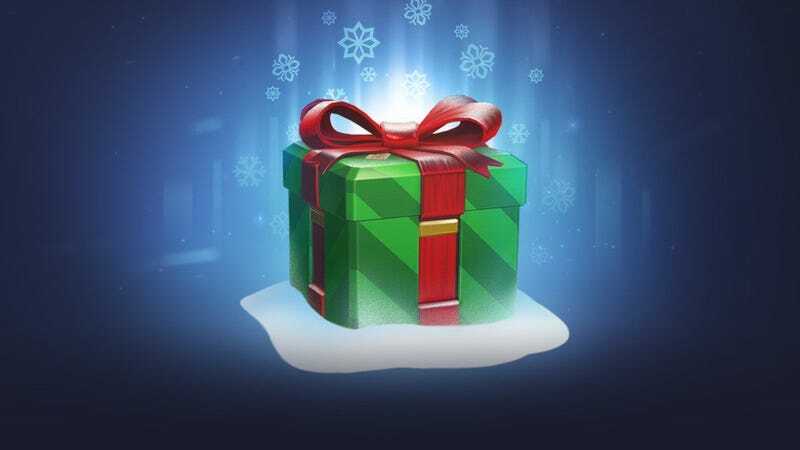 Alternatively, a Blizzard gift card that we could use to buy loot boxes would be perfect too! I promise to share what we got with the gift card in the comments! Get it? It’s a gift joke! Thank you for participating in Secret Santa and a gentle reminder—you’re the best.